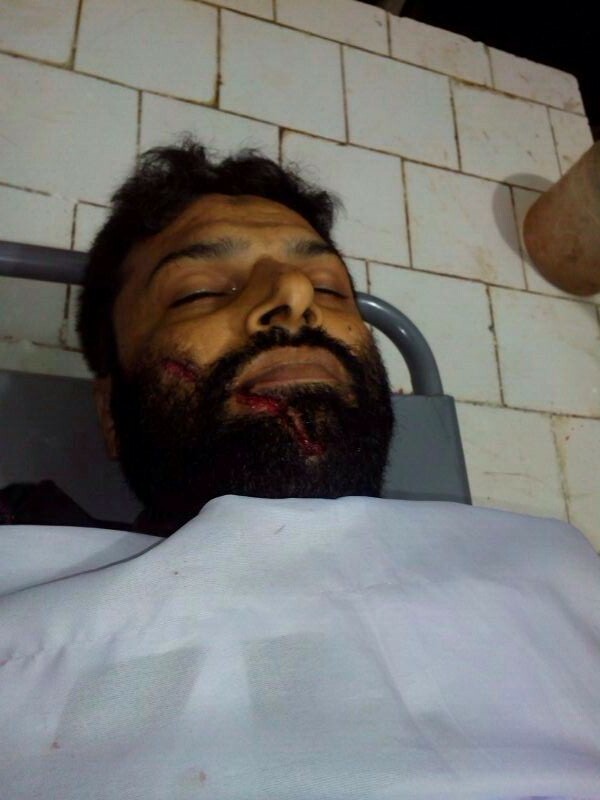 JNN 10 July 2013 Karachi : On Wednesday 09 July 2014 the as the Day got Darker , Late in the Night another Dedicated Shia Activist Asif Rajani s/o Akber Rajani ( Alias Asif Karbalai ) 42, was target Killed by the Taliban Terrorist in the Saddar area Near Empress Market . As per the details , Asif was on his way in his car, and as he reached near Empress Market the Members of TTP Target Killers Squad , intercepted and fired Mutiple Bullets targeting him , One of the Bullet Hit him in the face , while the others hit him in the Upper torso , due to which he was critically Injured . After firing the terrorist fled away , while Asif was rescued and was shifted to Jinnah Hospital , But due to the severity of the wounds , he succumb to his Injuries and embraced Martyrdom. After Medico Legal formalities his body was Shifted to Fatimiyah Community Center , Numaish . His Funeral Prayer was On offered Thursday, after Zuhrain Prayers , in the presence of thousands of Friends , Family Members , and Shia Community Members On the Main Numaish Round About , led by Molana Asghar Shaheedi . After the Funeral Prayer His Body was taken for Burial in a Big Procession to Wadi e Hussain , Super Highway , Karachi. Asif was on the Hit List of the SSP terrorist for a Long time, due to his Out Spoken nature and Being a Strong Shia Activist ,as he Had earlier survived two attempts on his life . In One of the similar attempt , in which he lost his life , was carried out in the Limits of Patel Para , where he was targeted while crossing the Patel Para area , he received a Bullet on his Right Arm , but he Bravely Drove his Car and reached the Hospital, with out any Help , and received the Much Needed Medical help and survived successfully. He was also a witness in a case , in which he has testified against the same Sipah e Sahaba Pakistan Terrorists , and since then he was Under threat and was continuously being on the watch and target List of the same Terrorist Group. He was a Dedicated Shia , and was Regular Pilgrim of the Holy Shrines of Iraq , Syria, Iran , especially Karbala and all the other Sacred Shrines of Ahlul Bayt . He was a successful businessman , and was involved in Multiple Business ,and was a Soft Hearted Man , and was involved in a Number of Relief Projects without any Discrimination of Cast , Sect or Ethnicity , and was always open to Help the Needy and Poor . He was Previously also associated with Jafria Alliance Pakistan , and was a Dedicated Activist , and has taken an active role in Politics , as he was also the In charge of Distt. East , Karachi of JAP , some years Back. And as he was a Dedicated Shia , and Person of good repute and Nature , so have good contacts with People from all the circles of Society , and was Popular among the Shia Community , as well as the Business Community . He has left 4 Kids , a Wife , And an Old Father in the Hiers . Analysis : As the Brave Army of Pakistan , Under the Leadership of his Courageous and Bold Leader is involved in a Successful Operation in North Waziristan , A Big Numbers of the terrorist , who have already left North Waziristan , as they were given ample of time , Under the Cover of so called Negotiation Process By the Present PML – N Leadership , to flee the areas , which was to be targeted in the Army Operation ,to their safe Heavens, Places Like Karachi , and other Parts of Pakistan . And Now as the Operation is in full swing , and has cleared a Vast effected area on North Waziristan , and as it is reaching its final Stage , as on daily basis vast areas of Land , area coming under the banner & writ of Pakistan Army , which was Untouchable , in the Presence of TTP and other terrorist Organisations in the same area . But Now the Terrorist who have Fled North Waziristan , as per the Guidelines given to them by their Saudi sponsors and enemies of Pakistan , who were updated on the Minute to Minute Basis the Secret Intelligence Reports By the Present PML – N Led Govt , who have sensed long time back , that an Army Operation is imminent and is in the Offing , As all the Top Military Brass , has given a go ahead to the Operation against the Terrorist , for the safety and prosperity of Pakistan. As Now the Secret in the Delay has also come to the Light , that the Previous Leader of the Pakistan Army , General Kayani , even Knowing all the facts , Desire of the Army Brass , and the Preparedness of the Professional Pakistani Army , Did not give a Go Ahead for the Much awaited Army Operation in North Waziristan , Just On his Personal Grounds , and the fate of the Nation , was decided on his Personal Desires , as Once again the history was repeated , As Even Once in the Past the Previous Army Dictator Gen Zia Ul Haq Did took action on his Personal Desires and Pushed the whole Nation in the Hell of terrorism and Sectarianism , for which the whole Nation , is till today Paying a Very High Price , Rather if it is said that the whole World is paying a Price , Than that will also be 100% Justified . Right now Whole of the Pakistani Nation , with No Options is Once again , seeing towards the Defenders of the Nation , the Brave Sons of the Soil , the Pakistan Army and its Leadership , to take another Bold Step towards the Prosperity of Pakistan , and should start Parallel , Impartial and with out any Discrimination , Army Operation in the Cities and Areas like Karachi , Quetta , Southern Punjab , with Help of the Other LEA’s , which may include Rangers , Frontier Constabulary , Police , and other all under the Army Command , so its Impartiality and Discrimination against any Sect , ethnicity , Group or Individual can be Maintained , and the Pressure from the Foreign and internal Mischief mongers can be thwarted and repulsed. And we are confident that if the above Mentioned steps are considered and an Action is Initiated against the enemies of Pakistan , this Fertile Land of Pakistan , can change the fate of the Whole World and Not Only Pakistan , in Next Five years time , and the Whole Region , will be a Piece of Heaven on the face of this World. Even the President of Karachi Chambers of Commerce Abdullah Zaki have also endorsed our requested action , and have voiced his deep concern about the Current Situation of Karaachi , which has been Plagued by Terrorism Due to the Presence of Terrorist Hide Outs in Karachi. But if Unfortunately , the Much needed Parallel action is not taken then whole of the Pakistan , will be a Play Ground for the Terrorists as they have already been evenly divided , and have Made their Hide Outs in every Nook and corner of Pakistan , especially Karachi , as it City of 20 Million People ,and Once they get a Signal from their Saudi Masters , who are already been Badly Beaten on Syrian and Iraqi Grounds , will take Revenge and there will be Blood on every Part of Our Mother Land , as per the Wishes and Desires of the Enemies of Pakistan , which they have even earlier indicated , as it has already been Planed to Prove the Decision of the Leader of the Pakistani Army Wrong ,which was against the wishes of the PML – N Leadership , especially Nawaz Sharif already frustrated , who want to work on the Agenda of the Saudi and the US Masters , to Litter Blood in the streets of Pakistan , in the same fashion as it has already been done in Syria, Iraq and Libya . This entry was posted in Asia Pacific, Pakistan News and tagged Alias Asif Karbalai, army operation, Asif Karbalai, Asif Mawji, Asif Mawji so Akber Ali, Karachi, North Waziristan, pakistan, Pakistan Army, Shaheed Asif Karbalai, shia Target Killing, Sipah e Sahaba Pakistan Terrorists, Taliban Terrorist. Bookmark the permalink.